I WENT LOOKING for traces of Wallace Stevens. They're hard to find, even though he spent 39 years in Hartford, from 1916 to his death in 1955, and is considered by many to be the equal of Mark Twain in literary stature. Stevens won a Pulitzer Prize and two National Book Awards. But while Twain was a popular writer and public personage who left tracks all over town, Stevens's name often draws a blank—partly because he wrote sensuous philosophical poetry in a city built on legal prose, and partly because he always kept the city at arm's length, not that it showed much interest in a closer relationship. He declined most social invitations, which soon dwindled anyway, and evaded most visitors. He rarely allowed anyone beyond his doorstep at 118 Westerly Terrace, where, after reading case files all day at the Hartford Accident and Indemnity Company, he could disappear into the radiant haze of his imagination. He was a hard-nosed attorney and insurance vice-president who excelled in the complex area of surety claims, yet in his notebooks refers to himself as "hermit of poetry." He was a prosperous burgher in appearance but wrote revolutionary verse like no one else's. His suits were all the same cut and color—steel gray—and he wore one even on his weekend walks in Elizabeth Park, yet some critics of his first book assumed from the playful elegance of his poetry that he was a frivolous dandy. He refused to act out the public's image of a flamboyant poet and disdained the romantic notion of starving in a garret for the sake of art. No, he wanted a steady income because, as he wrote one of his many correspondents, "I like Rhine wine, blue grapes, good cheese, endive and lots of books, etc., etc., etc., as much as I like supreme fiction." He also believed that poets who wrote for pay or took jobs in universities were soon corrupted by the need to please, which he avoided by making a good living in business. Though American artists flocked to Europe in the 1920s, and though Stevens was a devoted Francophile, he never visited the Continent. In fact, aside from business trips and an annual vacation to Key West, he pretty much stayed home. He carried on no love affairs, caused no scandals, and had no stirring adventures, except for one brief scuffle with Ernest Hemingway, in which Stevens got a black eye and broke his hand on Papa's jaw. Year in and year out, Stevens went to the office and came home. But there he wrote wonderful poetry. Poetry was his love affair, his adventure, his exotic travel. 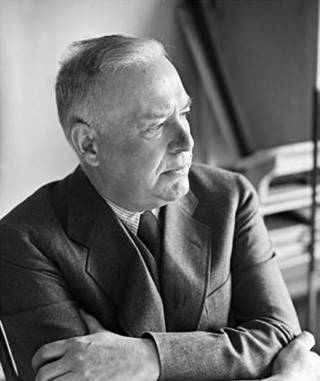 The noted biographer Richard Ellman wrote, "As a biographical subject, hardly anyone offers more difficulties than Wallace Stevens.… Instead of the urge to confess or at least to confide, which, happily for biographers, most of their subjects evince, Stevens displays a counterurge to conceal and fall silent." He ultimately failed at this in the wider world, where poets, readers, and scholars have lavished attention on him and placed him near the top in the pantheon of 20th century poets. Hereabouts, however, aside from a theater named after him in his old company, an annual poetry reading named after him at UConn-Storrs, and a mention in a humorous song by local singer/songwriter Hugh Blumenfeld, he remains largely uncelebrated. Don't ask anyone to point out "the Wallace Stevens house." Don't look for plaques or memorials or statues. Cedar Hill Cemetery doesn't even include him in the brochure that lists the notable people buried there. In fact, don't even look for his poetry in the city's bookstores. At B. Dalton in the Civic Center you can find Susan Polis Schultz in more than half a dozen titles in pastel bindings, but no Wallace Stevens. At the Reader's Feast you can find the latest gay, lesbian, and Third World poets, but no Wallace Stevens. Venture a bit farther out, to West Hartford Center, and seek Stevens at Bookworm or Encore Books—sorry, nothing. Supply usually reflects demand, and there's little of that for Stevens around Hartford, not even for free Stevens: in the last 22 years his Collected Poems has been checked out of the Hartford Public Library just a dozen times. Even while alive Stevens didn't have to work very hard to be ignored in Hartford, and his death evidently made the job easier. The city seems content to let its buried poet lie. But a small group of people are now working to resurrect him, or at least remind Hartford of his existence. The effort began with Dan Schnaidt, an administrator at Wesleyan. When Schnaidt moved to Glastonbury from New York two years ago he knew two things about the area: the Wadsworth Atheneum and Wallace Stevens. He found the museum but almost no trace of the poet. Then a year ago he went to an exhibit called "Painting in Poetry, Poetry in Painting: Wallace Stevens and Modern Art." The show, which featured works by Duchamp, Picasso, Klee, Dali, Claes Oldenburg, Jasper Johns, Richard Diebenkorn, David Hockney, and many others, had been conceived by a professor of English at UConn-Waterbury named Glen MacLeod, author of a convincing book on the ways that painting inspired Stevens, and that Stevens inspired painters. MacLeod tried for five years to interest a Connecticut museum in this Connecticut subject. He got turned down by the Atheneum ("They didn't think it would bring people in"), the Yale Art Gallery, and the William Benton Museum. The show ended up at Baruch College in New York, got reviewed favorably in the New York Times, and drew capacity crowds to several events associated with it. Last May, after attending the exhibit, Schnaidt wrote an op-ed piece for the Hartford Courant wondering why the city was ignoring its most renowned 20th century artist. A few people including MacLeod answered Schnaidt's call to action and began the hard work of resuscitating Stevens. Their first success was to convince ITT Hartford to expand the Wallace Stevens Poetry Reading by sponsoring a reading in Hartford as well as in Storrs. This annual event, now 32 years old, has featured many of the century's most accomplished poets. Schnaidt's group hopes to raise funds to build a statue of Stevens. "There seems to be a lot of enthusiasm for him in his business clothes, walking, because that's when he composed his poetry," says Schnaidt. Stevens habitually walked the two miles to and from work, devising lines to the rhythm of his stride. "That would catch him in his creative moment and also capture his link to the business community." In his op-ed Schnaidt suggested a Wallace Stevens page on the World Wide Web; the Courant responded by starting one as part of its home page. Schnaidt recently started another, which includes a few poems and essays. He hopes to add a cyber-tour of some of the places associated with Stevens: his house on Westerly Terrace, the insurance company on Asylum Hill where he worked for 39 years; Elizabeth Park, where he walked almost every day. Schnaidt would like to link this to the Wallace Stevens Journal, which, in keeping with Hartford's relationship with Stevens, is based elsewhere and is not available at the Hartford Public Library. Nor are his papers here. In 1975 his daughter Holly, a long-time Connecticut resident, sold them to the Huntington Library in California for $250,000. I MADE MY OWN tour of Stevens's residences. He and his wife Elsie moved into their first Hartford apartment in 1916 at 594 Prospect Avenue, at the corner of Farmington Avenue. I called Gardner Ruggles, Jr, who has lived in the building since 1988. Ruggles remembered reading some Stevens in high school English, "but nothing that sticks." When I told him that Stevens once lived in his building, he seemed pleased. "He did? Really?" Ruggles said the building has high ceilings, marble in the bathrooms, and cut glass in the foyer. "It must have been luxurious once." Many of the residents now are new Russian immigrants. Stevens and Elsie lived there only a year before moving to a new apartment closer into town, at 210 Farmington Avenue. It's an imposing U-shaped building made of yellow brick, across from the Aetna Institute. The Stevenses lived there from 1917-1924. It's where Stevens wrote most of the poems in Harmonium, his first book and the one that made his reputation, published in 1924 when he was 45 years old. The building is now filled mostly with young working people and some Section 8 families. Neither of the building's two oldest residents, Marshall Dockham, who's been there 42 years, and Charles Clark, who's been there 45 years, have ever heard of Stevens. In 1924 after the birth of their only child, Holly, the Stevenses moved to an upstairs apartment in a two-family home at 735 Farmington Avenue, not far across the West Hartford line. There Stevens suffered what he called his "lapse from grace," writing nothing for five years. Today it's the office and home of a chiropractor, Dr. Stephen J. Balkun. Balkun, 40, grew up in Hartford but had never heard of Stevens. Two months after he moved into the house someone showed up at his door and said, "I don't want you to think I'm weird, but I just did my thesis on Wallace Stevens at the University of North Carolina and he used to live here." Balkun has since developed an interest in Stevens's poetry, especially since he writes poetry himself. He writes in the same room where Stevens didn't. The residence most associated with Stevens is an 11-room house at 118 Westerly Terrace, just off Albany Avenue near Elizabeth Park. He lived there from 1932 until his death in 1955. Before Elsie died in 1963 she sold the place to the Episcopal Church, which has used it ever since to house the provost of Christ Church Cathedral in Hartford. The Very Reverend Richard Mansfield has lived there for five years and is familiar with the house's history. Tourists, usually English professors, occasionally knock on the door. Mansfield gives them a tour. "I had a passing acquaintance with his poetry before, but I read a lot more of it now," he says. "It's an interesting feeling, reading his poetry in the place where he wrote it. You really do feel his presence." Stevens and Elsie had a strained, strange marriage. He once said that he married her because she was the prettiest girl in their hometown of Reading, Pennsylvania, and she does look striking in old photographs. But she and Stevens were a bad match. He went to Harvard and was an intellectual; she had a grammar school education and little interest in ideas. Nor did she care for her husband's poetry, preferring Longfellow. She hadn't wanted to leave Reading, nor did she make friends easily, so it was hard on her when Stevens moved her first to New York, then to Hartford. His frequent long business trips during his early years here made things worse. By the time Harmonium appeared they were sleeping in separate rooms. Stevens's small study/bedroom on Westerly Terrace is now used as "a sort of dressing room," says Mansfield. Stevens liked to buy unusual plants and flowers, and both he and Elsie were avid gardeners. There are photographs of them standing amidst profusions of blossoms on Westerly, particularly in the backyard, where Stevens liked to sit on summer evenings. I wondered if Stevens's gardens still bloomed, if anyone still tended them. "No, they're gone," says Mansfield. "The story I have on that is that my first predecessor had bad allergies, so he did away with them. We recently had a another problem. Stevens planted a holly bush right in front of the house in honor of his daughter, but of course over the years it grew into a mammoth tree. It was invading the house. We also had a leaking oil tank in the front yard. We finally had to take the tree down, and we heard from a number of people, both neighbors and admirers of his poetry, who were not pleased about that. They felt it was a desecration." Mansfield chuckles. "So we are reminded from time to time of the heritage we have here. We've planted another holly bush." I mention the irony of a priest living in the house of a famous man who didn't believe in God and who tried to console himself with faith in the "supreme fiction" of poetry and art. Mansfield chuckles again. "There's a story about that. When the church was negotiating for the house with Mrs. Stevens, her asking price was more than the church could afford. Then she came back with a much lower price. The theory was that she took delight in selling it to a church because Wallace was an atheist and this was one last way to get back at him as part of their dysfunctional relationship." ITT HARTFORD has commemorated Stevens for many years through the poetry reading, and readily agreed to fund a second one. Many people at the company know that Stevens was a famous poet who worked there, but little else. The vice president who now occupies the office where Stevens worked for 34 years—east wing, fourth down from the rotunda, facing Asylum Avenue—was surprised to learn from me that her office had been his. Eric Rennie, director of public policy communications, was once in charge of the company's collections and searched for materials associated with Stevens. "All I could find were two autographed letters, which is remarkable considering that he was here for 40 years," he says. "I got interested about why there was so little on the most famous personage from our company, and I still don't know why. I think it's partly because he kept his business life so well segregated and also because he was not well liked. I talked to people who worked with him. He was not a beloved figure, to put it mildly. Everyone has notions of what a poet's personality is, but whatever emerged in his poetry, that was not his personality here. Herb Schoen [a young lawyer at the company during Stevens's last decade; he later became company president] once told me, 'I was one of the few in the company who could stand him and I wanted to knock his block off half the time.'" Stevens was intimidating in demeanor and size (6' 3", 220-250 pounds), and was notoriously brusque, with little patience for small talk or interruptions. In Peter Brazeau's fine oral biography of the poet, Parts of a World: Wallace Stevens Remembered, Herb Schoen recounts his first meeting with Stevens: "I'd only been with the company a few weeks, and this very impressive, large gentleman came in and said, 'I'm Wallace Stevens. I am told that I should meet you. Why?'" More than once Stevens answered long involved letters about surety cases with a simple devastating "No." After he died the brass wanted to name the company's theater after him but then decided to hold off. "A discreet amount of time was allowed for the scar tissue to heal," says Kevin Marton, who works in the company's corporate relations department and handles the company's end of the poetry reading. Stevens never learned to drive and often compelled company employees to chauffeur him on errands. “I’d come in to work from West Simsbury," remembers William Sanderson, 77, "and he got so he could recognize my car. He'd flag me down—he would put out one finger and stop me. This was maybe once every other week. I would then take him to Eagle Empire Laundry on Woodland Street to pick up his shirts, and then I'd drive him to work. I think he got so he knew my name. He was very taciturn. There was never any of this 'It's a nice morning' sort of thing. This was in the early 1950s and he was well-known by then, so I was flattered to death to pick him up. I then had an old station wagon, and it was something to see this elegant man getting into it." Stevens generally preferred to walk to work alone because he wanted the solitude to compose poetry. But Olcott Smith, 88, former chairman of Aetna, says Stevens sometimes made an exception. "My father, Harry Tyler Smith, lived on Belnap Road and sometimes walked to work with Stevens. Father would pick him up halfway down Asylum Hill. Stevens liked it because my father could whistle. He would whistle Wagner, and he and Stevens would walk, Stevens to the Hartford and my father to the Aetna. But at times—and this is a little embarrassing—a small company bus would come up there and in it would be Morgan and Newton Brainard, and Albert Putnam, and they would say 'Get in' to my dad but not to Stevens. I guess they didn't want him in the bus. Father never went to his house for a drink or dinner and I never saw him have Stevens into the house either. So it was a strange friendship. "Once when I was in school I was going skiing in Switzerland and father told Stevens. Stevens asked if I would look around for an Aeolian harp, named after the god of winds. So father asked me to do it and I looked around, but not too carefully, and I kind of forgot about it. When I got home father said, 'Did you have a good trip? And by the way where is Mr. Stevens's Aeolian harp?' Well, I'm my father's only son, his only child, and he was very very disappointed in me that I didn't realize Mr. Stevens deserved a closer look than I apparently gave him. Father had two or three of his poetry books but I don't know how much he read, and I don't remember him talking about the poetry. I once tried to read a little of him but I confess I found it difficult to understand. My wife knew a man from Baltimore who knew a lot about Stevens, but he was about the only man I ever ran into who did." STEVENS WAS ASOCIAL in Hartford, but not completely so. On Wednesdays it was his habit to collar a car-owning co-worker and take a long lunch at the Canoe Club, a businessmen's lodge on the river in East Hartford. Stevens liked the club's cold roast beef, large martinis, and gruff bonhomie. But even there his aloof disposition made people uncomfortable—he applied for membership for years before finally being admitted in 1948. There's no brass marker or remembrance of any kind about Stevens at the club, says Lincoln Young, its house chairman, nor does his name come up among the men who continue the tradition of business lunches there. Most days Stevens skipped lunch, preferring to take a walk alone. He often ended up at the Atheneum, where he was a generous annual contributor. He loved art, kept up with the newest movements and theories, and was himself a modest collector. As Glen MacLeod has written, Stevens's poetry was deeply influenced by Surrealism, Cubism, and Abstraction. Stevens was surely pleased when A. Everett "Chick" Austin turned the Atheneum into the most exciting museum in the country during the 1930s, hosting America's first exhibition of Surrealism, the first Picasso retrospective, the world premiere of an opera by Gertrude Stein and Virgil Thomson, and visits by many important modern artists. Yet Stevens always declined Austin's invitations to parties with the guest artists, where he could have exercised his interest in modern art. For such things he always went to New York, where he spent many weekends and where he had several friends in the arts. Nor did he ever mingle with the sociable Poetry Club of Hartford, which met regularly at a bookstore on Lewis Street and included such regional eminences as Odell Shepard, Wilbert Snow, and Robert Hillyer. One of the bookstore's employees told Peter Brazeau that though the store tried to push Stevens's poetry, it sold only three copies of the 1931 reissue of Harmonium: "You wouldn't find one in a thousand [among Hartfordites interested in the arts] who knew him by name, who he was." Though Stevens refused to play the poet in Hartford and usually brushed off questions about his poetry, he didn't hide the fact that he wrote it. His secretary typed whatever lines he had scribbled down on his walk to work that day. He sometimes sent subordinates to the State Library to look up words in its dictionaries. Yet he was adamant about maintaining his business identity and his privacy in Hartford, even when his reputation as a poet had reached the general culture. In 1954 when the Atheneum asked him to repeat a lecture he had just given at the Museum of Modern Art, he refused. He turned down requests by Life magazine and the New Yorker to profile him. In 1952 when Trinity College honored his fellow poet William Carlos Williams, whom Stevens knew and corresponded with, Stevens declined to attend and instead suggested that Williams stop by Westerly Terrace on his way out of town. "I want to keep Trinity at arm's length (to be plain about it)," he wrote to another correspondent, "because I want to keep everybody at arm's length in Hartford where I want nothing but the office and home as home." In 1944, against Stevens's wishes, Holly married John Hanchak, a repairman of business machines. They had a son, Peter, in 1947, and divorced in 1951. After her father's death from stomach cancer in 1955 Holly devoted much of her life to Stevens's legacy, editing a fine selection of his poems (The Palm at the End of the Mind) and a fascinating volume of his letters. She died in Guilford in 1992. I found Peter Hanchak in Charlottesville, Virginia. Hanchak is a friendly man, but the conversation didn't go as I expected, though by this point in my search for Stevens I probably shouldn't have been surprised. "I remember completely inconsequential information," he says. "I was only 8 when he died and he wasn't the kind of grandfather you played ball with or anything. It was Sunday visits, mostly. I can't recall having any real interaction with him. The few times I was plunked in his lap, I remember playing with the fat little place between his thumb and fingers." He laughs. I ask if he reads his grandfather's poetry. "The simple answer is no. I don't lean much toward poetry." When I bring up how Stevens turned his back on Hartford and received the same treatment in kind, Hanchak says with some force, "It's a perfect case of you reap what you sow. He was very private. He was so up in his head all the time that a lot of stuff that I would consider normal, like getting to know people, wasn't a big feature of his life. He wasn't a worldly guy, he was an otherworldly guy. Look at the words he uses. My son just memorized 'The Emperor of Ice Cream' for school, and I mean, 'concupiscent'? Give me a break. How many guys use words like that?" Instead I tell Hanchak that I've been reading his grandfather's poetry for 25 years and that it constantly moves and surprises me, though I don't always understand it. I would like to tell him how much I've learned from it about ways of seeing, how often it gives me sheer pleasure and solemn pause. But this doesn't seem like the right moment, and besides, my response is, to quote Stevens again, "Just one more truth, one more /Element in the immense disorder of truths." So I just say that I wish Hartford showed more interest in his grandfather. "It's not like I don't appreciate the guy," says Hanchak. "He was sensitive on a scale that goes beyond. And sometimes I have thoughts about regaining the house on Westerly Terrace and turning it into a museum. So many people would just like to take the walk he took and feel a little of what he felt." It's all there in the poetry. STEVENS'S FINAL Hartford residence is Cedar Hill Cemetery. I visited on a drizzly morning dense with fog. Though I knew his address—section 14, lot 64—I couldn't find him, and drove around and around, shadowed by raucous crows that swooped in and out of the fog. It seemed like a metaphor as well as another of Stevens's evasions. I finally found the right section, off by itself, out of order, in the opposite direction that logic would suggest. It figured. Even then I couldn't find him. After tramping through the slush and drizzle for 20 minutes I finally conceded victory to Stevens and turned back toward the car. That's when I saw his marker, obliquely, out of the corner of my eye. I had passed it half a dozen times. Nothing on the modest brown-granite stone hinted that the man buried there was an acclaimed poet. As taciturn in death as in life. The drizzle suddenly turned into rain, making my notes run and sopping the paper so that finally my pen wouldn't write at all. I chuckled and ascribed it to Stevens, still carrying privacy to absurd lengths. He would hate this article.